Some critics were quick to liken this assured Spanish language chiller to Japanese horror films such as Ju-on: The Grudge. Young Mexican writer-director Rigoberto Castaneda’s debut does share the creepy atmosphere of the J-horrors, and it boasts a similar supernatural femme fatale, but KM31’s plotting is far more comprehensible than many of its Eastern genre counterparts, and its vengeful antagonist draws on a Mexican folklore myth used by grandmothers to scare naughty kids (of which Castaneda was evidently one). The legend of La Llorona (or the Crying Woman) rears its withered – and withering – head when a young woman accidentally runs down a boy on a lonely stretch of highway and subsequently and unexplainably falls into a coma. 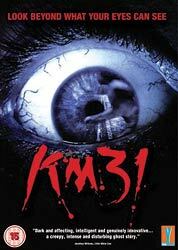 A continuing psychic link with her sister prompts the waking sibling to investigate what turns out to be a series of ‘accidents’ at the point of a road marked by the KM31 sign. Extras include making of featurette, trailers and a photo gallery.